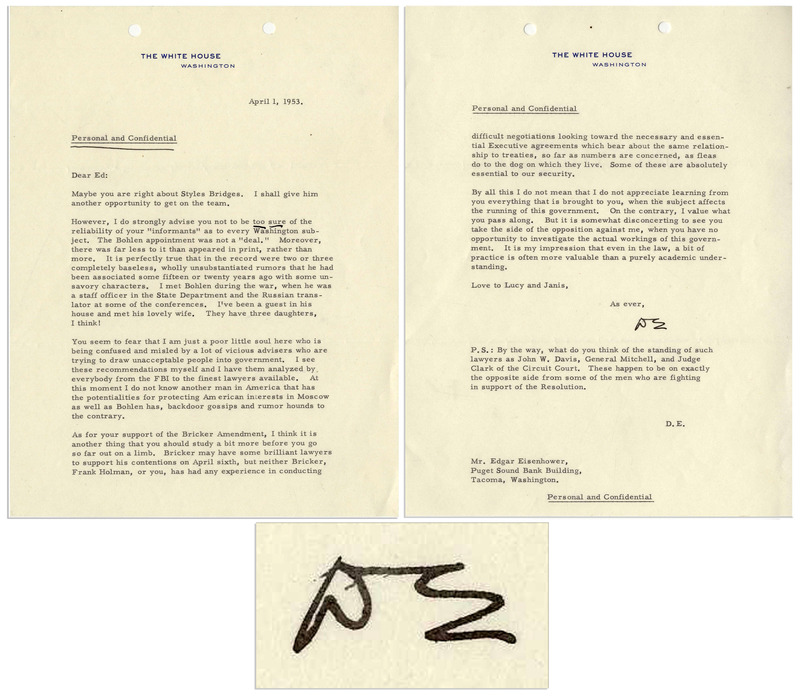 Dwight D. Eisenhower typed letter signed as President, dated 1 April 1953 on official White House stationery. Here, Eisenhower writes to his brother Edgar, who seems to have exasperated the President: ''...The Bohlen appointment was not a 'deal.' Moreover, there was far less to it than appeared in print, rather than more. It is perfectly true that in the record were two or three completely baseless, wholly unsubstantiated rumors that he had been associated some fifteen or twenty years ago with some unsavory characters. I met Bohlen during the war...You seem to fear that I am just a poor little soul here who is being confused and misled by a lot of vicious advisers who are trying to draw unacceptable people into government. I see these recommendations myself and I have them analyzed by everybody from the FBI to the finest lawyers available. At this moment I do not know another man in America that has the potentialities for protecting American interests in Moscow as well as Bohlen has...As for your support of the Bricker Amendment, I think it is another thing that you should study a bit more before you go so far out on a limb. Bricker may have some brilliant lawyers to support his contentions...but neither Bricker, Frank Holman, or you, has had any experience in conducting difficult negotiations looking toward the necessary and essential Executive agreements which bear about the same relationship to treaties, so far as numbers are concerned, as fleas to the dog on which they live. Some of these are absolutely essential to our security...'' Signed ''DE'' in black ink. Letter measures 8'' x 10.5'' on two pages, with two holes punched, minor toning and two folds from mailing. Near fine.